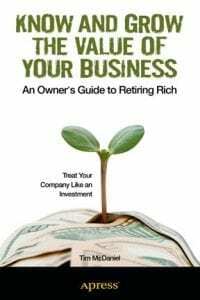 If you don't know the current value of your business or what steps you can take to increase it's value, Know And Grow The Value Of Your Business: An Owners Guide To Retiring Rich, is the best place to start. Written by Tim McDaniel, CPA/ABV, ASA, CBA, a principal with Rea & Associates and director of the firm's consulting services group, Know & Grow is a guide designed to help you change your mindset when it comes to managing the financial well-being and long-term sustainability of your business. Tim believes that businesses should be treated like investments and, in doing so, you must nurture and protect your business assets. By taking the time to know and deliberately grow your business, you will gain the insight needed to ultimately exit your business on your terms. The importance of treating your ownership interest in a business as something deserving near-daily attention. How a company is valued, and how others outside the business view that value. Steps you can take immediately to increase the value of your business. The different kinds of potential buyers and what attracts them. How to remove yourself from the day-to-day work of the business to plan for a brighter future. How to exit the business on your terms. To purchase a copy of Know and Grow The Value of Your Business: An Owner's Guide to Retiring Rich, click here. Know And Grow The Value Of Your Business has been met with rave reviews. Check out what these readers had to say or click here to read all customer reviews on Amazon. "This book should be required reading for all owners of private or family businesses." "The author used a lot of real life examples of companies from various industries and different stages of development on what to do as they prepare to transition their business in the short, medium and long term. He also shares real life mistakes he's seen businesses make, which is equally helpful. He makes the point over and over again that a business is an investment, just like stocks or real estate and that owners should want to do whatever they can to protect and grow their investment." Tim cuts to the chase in advising owners on what to prioritize in monetizing and maximizing value of their single largest asset.